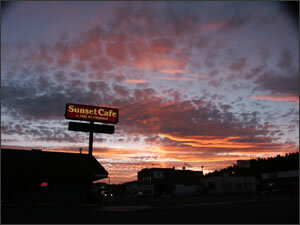 The first time we went to the Sunset Café was last summer in 2005. 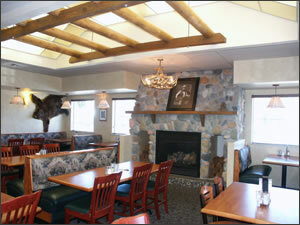 You can find the best of the Northwest by traveling to the smaller towns and the beautiful state highways. We chose to drive through Cle Elum, off Interstate 90. Our stop in Cle Elum was very relaxing, such a peaceful community. We found a room at a quaint little motel, the Aster Inn and asked the owners where to find the best place to eat, and their reply was the Sunset Café, so we set out immediately to give it a try. The Sunset Cafe & Loose Wolf Saloon, established in 1936 is the oldest restaurant in the Kittitas County and was named for the old Sunset Highway, which traveled east from Seattle through Cle Elum. The owners encourage all to stop by, they say "no need to dress up - come as you are!" We were not disappointed. One of the most appealing things about the Café is the friendly folks who make you feel at home. 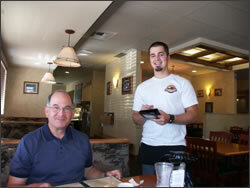 We talked with our server Jared quite a bit and besides the excellent food had a very enjoyable visit. We decided this was definitely a place to return time and again. This year (2006) we again visited the area and stayed overnight in Cle Elum. The dinner at the Sunset Café was even better than we remembered. Murry enjoyed their Fried Prawns, which was the best seafood dinner he had this summer, even though we went on to the Washington coast and ate at the famous Anthony’s in Everett. 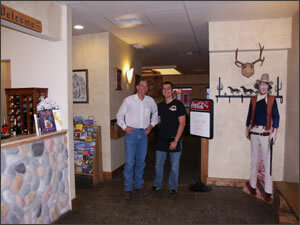 Again we had an opportunity to visit with our server, Jeremy Sutton. Jeremy is planning on going to Paraguay on an educational exchange program. Julie was able to get some fabulous pictures of one of the most incredible sunsets we have ever seen. The next morning we had breakfast at the Café and were pleasantly surprised to find Jared as our server. We were able to renew our acquaintance and also had an opportunity to talk with his father, Joey Carter, who is the owner of the Sunset Café. On our return trip to Boise we again chose the road less traveled and went through Cle Elum, just in time for lunch. We thoroughly enjoyed our lunch and this time made room to sample the homemade pie, baked fresh by Joey’s wife, Terry. We told Jared to give our compliments to his mother, the pie was delicious. 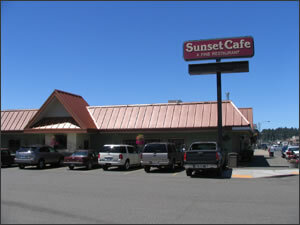 The Sunset Cafe is a unique restaurant, one that Julie's deceased father would have loved. He would have traveled an hour every day and brought all of his friends and family. He would have eaten breakfast, lunch, and dinner. 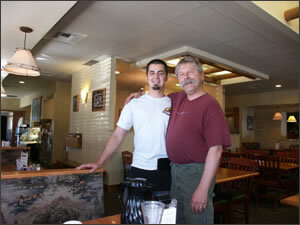 Why do we have such high regard and fond affection for this restaurant in this little town? I think they say it the best - "Five generations of handmade food, prepared by our family, for your family ~ a generation above the rest!" One other thing that attracted me to the Sunset Cafe is John Wayne. My dad always reminded me of John Wayne. And there he was bigger than life, a huge picture of the Duke on the fireplace mantle and a life size cutout at the front door. We are looking forward to visiting again. The Sunset Café is listed in the book Hot Showers, Soft Beds and Day Hikes in the North Cascades - by Sally O'Neal Coates. We found a copy of the book listed at Powells Books. We had an opportunity to stop by the Cle Elum/Roslyn Chamber of Commerce and spoke with Jack Stoner, the owner of the local newspaper, the Tribune. The Chamber of Commerce was excited to tell us about the resort community Suncadia, which includes more than six thousand acres in the Kittitas County, a place to build your family homestead or lifetime memories. In 2005 we stopped by Roslyn to take in the sights of the community that has been a favorite of Hollywood, known to many as Cicely, Alaska in the 1990's hit TV series, Northern Exposure. We haven't visited during Moosefest, but we understand fans of Northern Exposure gather together during Moose Days held annually in Roslyn, Washington during the last full (third or fourth) weekend of July.